The Bingo U8 Smartwatch is just the right mix of features to make your daily activities effortless and simple. 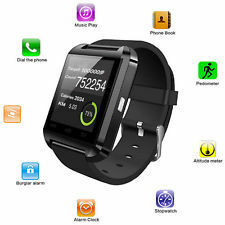 Manage your calls, texts and more with this watch. It’s compatible with all Bluetooth V2.0 or above enabled smartphones, tablets and PCs (support Android 2.3 or above), such as Samsung S3, S4, Note 2, Note 3, and Note 4. Flipkart offering Bingo U8 Smartwatch Rs. 697 only.